These are the Best High Performance Air Filters available anywhere! One of the most important part of getting the most out of your Vipers 8.3L, V-10 engine is allowing maximum air flow to it. 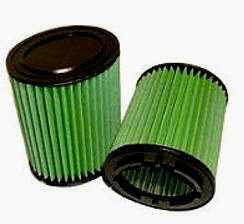 Replace your air filters with Super High Performance Air Filters from Green. The Highest Flow Filters In The Industry; Increased Fuel Mileage and Horsepower, Washable, Included is the required 2 Filters for your Viper. These new filters developed for team Oreca Viper race team offer 20% more flow than the production filters and filter down to 5 microns. The production SRT/10 Air Box is a very efficient design, except for the filters, until now the only filter available was the K&N. Unfortunately, it was not properly sized for this application. These filters are washable and reusable and have a very rigid construction. Air Filters as shown above. Guaranteed Horsepower Gain: +14.06 HP @ 5300 RPM! Easy to Install. 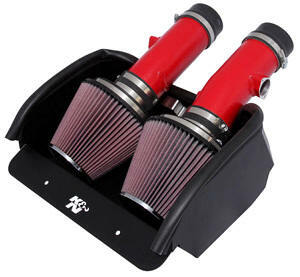 Includes two K&N Replacement Filters for the Cold Air Intake System. High Performance - over 18 HP Gain! The 2008-10 Dodge Viper defines brute power. Equipped with an 8.4-liter, 10-cylinder engine, the 2008-10 Dodge Viper is capable of producing over 600 horsepower. The Viper is often considered primitive when compared to ultra-luxurious supercars from Europe. However, what the Viper lacks in plush trim and options, it makes up for with its track credentials. K&N’s Research and Development Department tested a 2008-10 Dodge Viper 8.4-liter V10 on our in-house dynamometer. Results showed horsepower increases throughout the RPM range with a shocking peak horsepower gain of 18.69 horsepower @ 5,300 RPM! 69-2527TTR provides improved performance with attractive red powder coated aluminum intake tubes to match the 2008-10 Viper’s valve covers. K&N air intakes completely replace the restrictive factory air intake assembly with an aerodynamically engineered tube and an oversized air filter. With a K&N Performance Air Intake System, consumers can count on extra horsepower whether cruising along with fellow Viper owners, or competing on the track. This air intake system uses two conical shaped, chrome topped, high-flow air filters (RF-1048) and a powder coated aluminum heat shield in place of the vehicle’s stock air box. The result is an air filter that captures harmful particles, flows more air, and provides long service life. 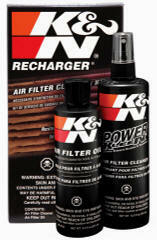 This K&N air filter performs for up to 100,000 miles before service is required, depending on driving conditions. Improving the air path between the filter and the engine are the powder coated aluminum intake tubes. Our powder coated aluminum intake tubes offer power and a stylish appearance. 69-2527TTR takes about 90 minutes or less to install, using stock mounting points, req uires no drilling, and is covered by the K&N Million Mile Limited Warranty. The 2008-10 Viper is reported to accelerate from 0-60 mph in 3.7 seconds, cover the quarter mile in 11.8 seconds, and reach top speeds of around 200 mph. Combine that level of sheer power with the ability to precisely maneuver through turns, stop from 60-0 mph in around 100 feet, and the 2008-10 Viper will leave a venomous taste in mouths of European supercar owners. 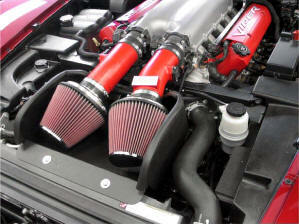 The stock 2008-10 Viper intake tract uses a dual throttle body set up fed by a common plenum with a single air filter. K&N intake 69-2527TTR replaces the stock pieces with twin powder coated mandrel-bent aluminum intake tubes and dual K&N high-flow air filters for improved air delivery. 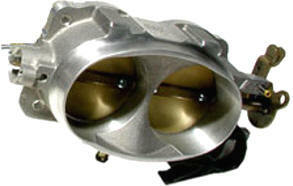 BBK 1767 67mm Twin-Bore Throttle body. Want to notice a real difference when you step on the accelerator pedal? Improves airflow by 30-35%. Adds 12-15 horse power. The beast living under your hood feeds on 2 things: air and fuel. Shovel more of those 2 ingredients down his throat, and he’ll reward you with more power. When you bolt a BBK Power-Plus Throttle Body onto your motor, it’s like adding an oxygen feeding tube directly into your engine’s belly. Every time you hit the gas, your Power-Plus Throttle Body dishes up more horsepower, more torque, and lickety-split throttle response. With over 2 decades of experience, BBK knows how to engineer white-knuckle performance throttle bodies. Each is custom designed for maximum airflow and a direct bolt-on fit, so you don’t have to fidget with adaptors or modifications. Plus, your BBK Power-Plus Throttle Body is CNC-machined from premium 356 aluminum and equipped with double-seal bearings, o-ringed throttle shafts, and precision die-stamped linkage.